Tickets for the annual Student Designer Fashion Show, The Collective are now on sale in Building 27, Room 203/209. The tickets, which are $40 each, are available on a first-come, first-served basis, cash or check only. 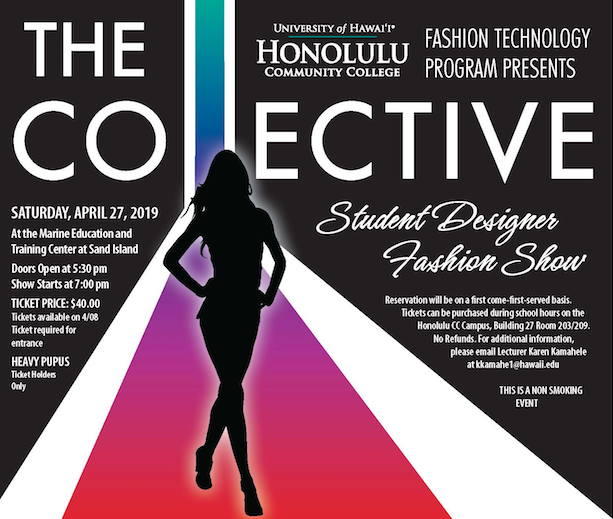 The show will be held April 27 at the school’s Marine Education Center at Sand Island, Doors open at 5:30 p.m. Show starts at 7 p.m.
For more information, contact Karen Kamahele, kkamahele1@hawaii.edu.